Description: Released in Sydney, Australia on January 30, 1994, this poster contained dozens of memorable Disney villains. 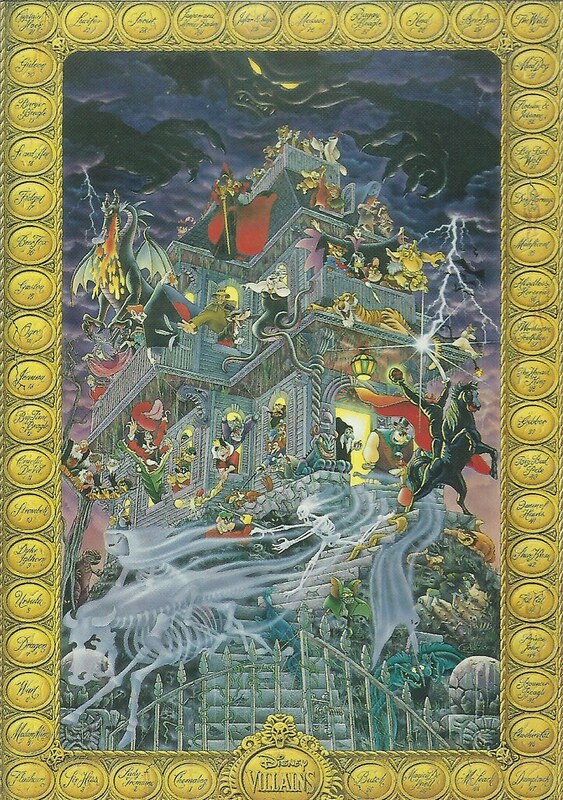 They ranged from the animated features (Snow White and the Seven Dwarfs to Beauty and the Beast), the classic shorts (Butch and Pete), and The Disney Afternoon (The Beagle Boys, Don Karnage, Duke Igthorn, and Magica De Spell) in one large view of the Haunted Mansion. Fidget was the chosen villain from The Great Mouse Detective, not Professor Ratigan. Around the border of the poster is fifty oval-shaped names of the villains. Fifty oval-shaped stickers came with the poster to place on each name of the villain. An advertisement to order the poster appeared in several issues of StoryboarD/The Art of Laughter magazine during the 90's. Where can it be purchased: Since the poster was a very limited edition, it cannot be found anywhere unless by sheer luck at a comic convention or Disneyana show. Characters are © to Disney.